The Kirby Ultimate HEPA vacuum cleaner is designed to give you consistent cleaning results for decades. 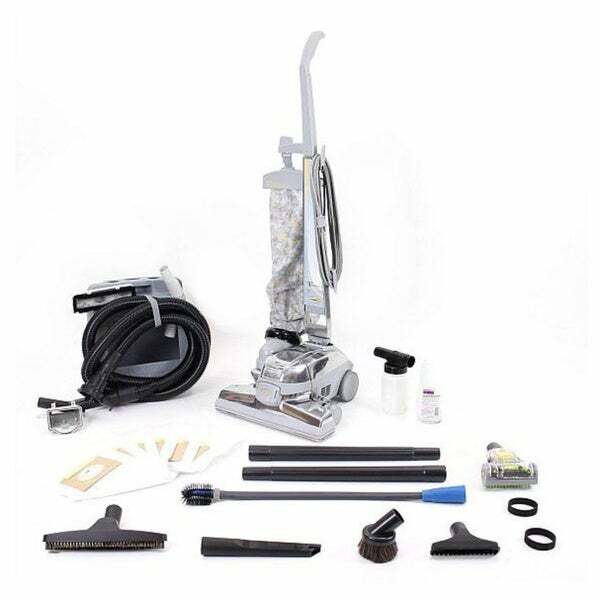 This deep-cleaning vacuum features HEPA filtration system, perfect for Allergy suffers. This is a great vacume, I was so impressed the first time I used it, has great suction power, I had a kirby for many years and gave it to my daughter when I moved, I bought a couple of cheaper vacumes in between this Kirby and decided they were junk and never again would I waste my money on a vacume made in China, this vacume is made it the USA and built to last forever, It also comes with a 5 yr. warranty so dont buy the warranty they offer, I did and they told me later that they credited my account as this already comes with a 5 yr warranty...there are attachments also that are great for all areas in your home, I also noticed a cheaper Kirby but I chose to go with this one just because of the previous review and that it was made in the USA...thanks again Overstock this came well packaged and very quick.....I absolutely love it very easy to use and great power!!!! I have been using this vacuum for 3 years and it still works great. I like the Kirby vacuums. Seems to be the best on the market. The refurbished one I purchased works great. The only problem was that there was a small screw missing that controls the drive system. I put one in where it was missing and it works just fine. If I ever need another Kirby, I will probably buy one that is brand new. But that won't be for another ten years or so. This is the third Kirby we have owned in the last 22 years. They are just great. I don't believe I have ever written a review but it has been over 4 years now and I still love my Kirby. I got an in-home demo 8 years ago. I was sold on the product but not sales girl she was insulting and threatening. (I even *69 the phone number after she left to complain to her boss they were very apologetic and offered me a reduced price model still out of my price range.) The refurbished one I did buy with a warrantee and all bells and whistles its great every time I use it. Whenever anyone is discussing replacing there vac I just say Kirby, you cant sway me. I grew up with the "E" kind, and a lot swear by them. I say that is fine if you want to do the job twice. I call it the monster. Love the machine. The first time I used it I was surprised how much dirt our old machine had left behind. The suction is powerfull. The self propelled option works great and makes it easy to vaccum. This machine will last a long time. It is well made - made to last! As comparisons go, it's better than sliced bread. It's the best thing in dirt sucking I've ever used and at a reasonable price. Love a Kirby...........great product and even greater price!! It worked but had a grating sound that only got worse. Had to take it to an authorized Kirby repairman. It performed well and picked up the mess in my carpets making it beautiful looking. Not good for tri-level house. Too heavy to carry up and down 3 floors. Maybe good for ranch house. Cant get under much because its to big. Still use my old dyson over the kirby. "Does this Kirby also shampoo?" All Kirby Vacuums have the capability of shampooing, however I did not order the shampooer attachment. I have an old Kirby Vacuum Cleaner and it has served me well. I cannot find a replacement cord for it on the website....and I like the way Kirby out performs the other vaccum cleaners. I cannot wait for it's arrival. "Does the ultimate Kirby vacuum come with a five year warranty?" Hello gpfguy, unfortunately this vacuum does not come with a 5 year warranty because it has been refurbished. I hope this information is helpful. Thank you for shopping with us. "Does this vacuum have a beater bar? I'm looking for a self propelled that does not have a beater bar for my plush carpet." Hi scalifar, this unit does feature a beater bar otherwise known as a brush roll. Unfortunately we are unable to find a self propelled unit without one. We apologize for the inconvenience. "Does the Kirby perform well on hardwood floors? My home is 90% hardwood with rugs." "How much does the vacuum cleaner weigh? Is it easy to use." The weight of is about 33lbs. I believe it is easy to use.